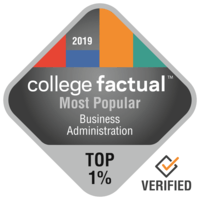 The Most Popular Business Administration & Management Colleges in the U.S.
Business Administration & Management is a major studied within the field of Business, Management & Marketing. Out of the 384 college majors analyzed by College Factual, Business Administration & Management is the 1st most popular. Not only that, Business Administration & Management graduates make up 182,008 of the 432,102 Business, Management & Marketing graduations per year. Men make up 52% of the student body while 48% of Business Administration & Management students are women. The Southeast region is home to the most common Business Administration & Management colleges. The list below ranks colleges based solely on the popularity of their Business Administration & Management degree. Read the methodology. Seeking the best of the best? Look into University of Phoenix - Arizona to pursue your degree in Business Administration & Management. Experience a high focus on Business Administration & Management in the degree program at UOPX - Arizona. With more than 20,000 students, this institution is one of the biggest schools in the nation. You will be able to learn about numerous ethnicities thanks to University of Phoenix - Arizona's diverse population. There is a grad program accessible for those who are curious. Take a virtual tour for more information on University of Phoenix - Arizona's campus. Any student who is interested in Business Administration & Management has to look into Ashford University. With 2,226 undergrads, Business Administration is quite a popular major at Ashford University. Looking for a big school? This school has more than 20,000 students on campus. The campus at Ashford University is highly diverse and is represented by undergrads from across 49 U.S. states and 1 nations around the world. Considering that 78.0% of students at Ashford University get educational funding, be sure to complete the FAFSA. A virtual tour may be a good way to explore Ashford University. Any student pursuing a degree in Business Administration & Management needs to take a look at California State University - Fullerton. Business Administration is a popular choice at California State University - Fullerton with over 2,155 graduations in 2017. Want a sizable student body? This institution has over 20,000 students on campus. This school is thought to be a good decision for veterans and military members. At least 48.0% of the professors at Cal State Fullerton have full-time hours, so they have lots of time to focus on their students. Learn more to see just how well California State University - Fullerton ranks in other categories. It is hard to find a better school than Southern New Hampshire University if you want to pursue Business Administration & Management as a major. A favorite major for undergrads, there are roughly 1,805 students enrolled in this program at . Located in Manchester, New Hampshire, this institution is a sound option for students who enjoy the thrill of a large city. There is a graduate program accessible for students who are curious. Due to Southern New Hampshire University's excellent on-time graduation rate of 49.2%, college students typically acquire less debt compared to what they would at other schools. Get an idea of what campus life at Southern New Hampshire University is like by enjoying some campus videos. It's hard to find a better school than Colorado Technical University - Colorado Springs if you want to study Business Administration & Management. The Business Administration program at Colorado Technical University - Colorado Springs is very focused. With more than 20,000 students, this institution is one of the biggest schools in the nation. You will get to learn about many different ethnicities thanks to Colorado Technical University - Colorado Springs' diverse student body. This school provides graduate degree programs for students who need to carry on after achieving a bachelor's degree. For more information, check out the college scorecard. Columbia Southern University is a good decision for students pursuing a Business Administration & Management degree. At Columbia Southern University, Business Administration scholars get the plus of a very focused curriculum. This school has one of the largest student bodies in Alabama. There is an advanced degree program obtainable for those who are intrigued. Many Columbia Southern University first-year students receive scholarships. Take a virtual tour to explore Columbia Southern University's campus. It's hard to beat San Jose State University if you want to pursue Business Administration & Management as a major. After getting their bachelor's degree, Business Administration students usually earn an average of $48,456 at the beginning of their careers. San Jose State University has one of the largest student bodies in California. Freshmen are not required to live on-campus at San Jose State University. This institution understands how to handle the specific needs of international students, since 7.1% of its student body is from other countries. Take a virtual tour to know more about San Jose State's campus. It's hard to beat Western Governors University if you wish to pursue Business Administration & Management as a major. At Western Governors University, Business Administration students have the benefit of a really focused curriculum. This school is located in the suburban area of Salt Lake City, Utah, near to shops and other entertainment. Graduates of this school typically don't have problems paying back their student loans; only 4.6% have defaulted on their loans. This school does not require freshmen to live on-campus. Where is Western Governors University really succeeding? Check out all of the school's rankings. It's hard to find a better school than DeVry University - Illinois if you want to pursue Business Administration & Management as a major. The Business Administration program at DeVry University - Illinois is highly focused. Chicago, Illinois is an appropriate surrounding for individuals who appreciate the active urban lifestyle. Students should not let costs stop them from applying to this school since 83.0% of undergraduates receive school funding. First-year students are not required to live on-campus at DeVry University - Illinois. Check out all of DeVry University - Illinois' rankings to learn more about the college. It's hard to find a better school than San Francisco State University if you wish to pursue Business Administration & Management as a major. After graduation, Business Administration students generally make an average of $47,844 in the first five years of their career. With more than 20,000 undergraduates, San Francisco State University is one of the largest schools in the nation. Graded #32 in California for overall value, we might have predicted this university's superb educational programs to be higher priced. Students who get degrees from San Francisco State University are being successful in the world as they are much less likely to go into default on their loans especially when compared to graduates of other schools. For additional information, look at college scorecard.